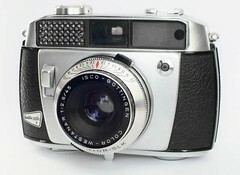 Baldamatic was the name of a range of 35 mm cameras made by the German company Balda from about 1958 to about 1962. They were all equipped with a coupled selenium lightmeter. 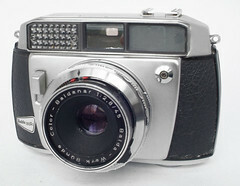 The simplest of the Baldamatics lacks a rangefinder and is fitted with a Prontormat shutter. The aperture is set by a ring with a range of light conditions, the speed is automatically calculated from 1/30 s to 1/300 s (aperture priority mode). 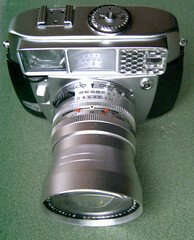 The lens is a 3-element Color-Baldanar 2.8/45. 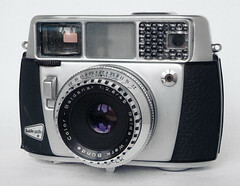 The Baldamatic I is a semi-automatic rangefinder camera with a match-needle exposure system. Several variants of lenses and shutters were available. 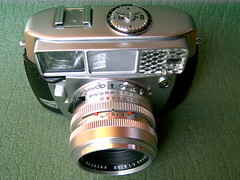 The Baldamatic II is an improved version of the Baldamatic I, including a larger viewfinder. Several variants of lenses and shutters were available. An export version was called Helioca. 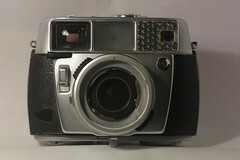 The top model in the Baldamatic range was similar to the Baldamatic II, but offered an interchangeable lens mount, for which lenses of focal lengths 35mm and 135mm were available. This page was last edited on 22 August 2018, at 19:38.